OCEAN FRONT 12 Bedrooms, 12 Baths (Sleeps 32),Great for WEDDINGS,FAMILY RETREAT! Come splash in the surf at Splash Kingdom, located at scenic Ocean Isle Beach on the coast of North Carolina. 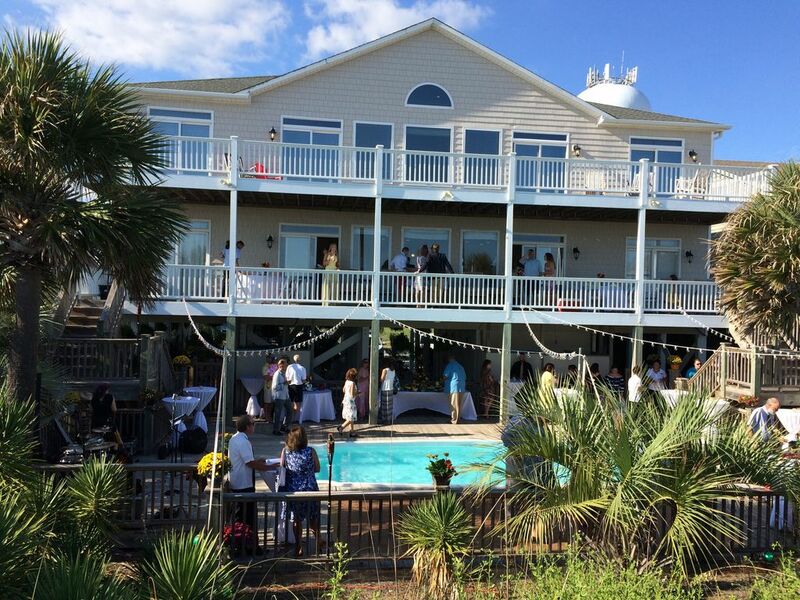 You'll be amazed at the spaciousness of Splash Kingdom which is the only true 12 bedroom Ocean Front Beach House on OIB GREAT for family reunions and the #1 Wedding destination in the area! Splash Kingdom sleeps 32 comfortable all in private bedrooms with private baths, there are 4 king suites all are Ocean Front with balconies and HDTV's, 6 bedrooms have both queen and twin size beds and HDTV's, 2 rooms with twin bunks beds also with private baths. When you are finished exploring the beach for the day, shake off the sand, come in and relax in the large living room (32 x 17)featuring a 36' HDTV for your enjoyment. While the adults are relaxing in the living room, the kids have there own separate (32 x 15) game room to catch their favorite sporting event on the 65' wide screen HDTV, also equipped with a foosball table and game table. Both living areas have a wide range of age appropriate DVD's and games. Chances are that from all that sun and fun you are going to work up quite an appetite. The chefs in your family will love the fully equipped kitchen. It features a 5 burner cook top with a double oven, double refrigerators, as well as 2 microwaves for all that late night popcorn. A double washer and dryer combination will help insure that your wardrobe is always ready for the next day's adventure. There is a private pool for swimming with new deck large which can accommodate 80+ for a sit down dinner. Heat the pool to make the worlds largest hot tub! $75.00 surcharge per day. Imagine hosting your Wedding, Bible study or spiritual retreat group on one of the double decks overlooking the ocean (8 rockers and 2 double swings). The property is also great for office getaways, family reunions, and any other event that brings relatives and friends together for a little rest and relaxation. It also goes without saying that Splash Kingdom is tailor made for a destination wedding. Imagine, years later, looking back at photos of your big day, you'll take pride in the fact that you chose a memorable venue for your service and was able to enjoy the company of your family and friends in a location that they still remember fondly. Your children will love playing in the surf and digging for shells on the beach. This is a non-smoking, no pets allowed facility. Splash Kingdom is available for off-season nightly rental (minimum - 3 night) and bookings may be made at any time up to two years in advance. We look forward to hosting you, your family, and friends at Splash Kingdom, Ocean Isle Beach, North Carolina and we feel sure that you'll return again and again. Over 30 golf courses with 15 Miles. Catering Available. We had 28 people in this house for a week. The kitchen was perfect for cooking and serving. Two fridges, two sinks, two dishwashers, and plenty of kitchen items needed for cooking made for enjoyable meals. With 12 bedrooms and showers, everyone had comfortable room to sleep and get ready. The house has two sets of washer/dryer. Ocean front meant walking out of the house and right onto the beach. The pool would have been nice, but we rented in the winter and didn’t use it. But, it would provide a great alternative to the ocean. There was plenty of parking for everyone. We used the gas grill (it’s a stand alone grill). Craig was always responsive on every communication I sent and got back to me within a day, usually sooner. Overall, we really enjoyed the house. Has all the amenities and a pool! This house is amazing. It is stocked with anything you could possible need. Beds were very comfortable. Owners was great to work with. The house is very spacious with an exceptionally well stocked kitchen. We had the pool heated and it was wonderful. The kids swam every day even though we didn’t have hot weather. Well used, but clean and cared for. The layout of the house was perfect and each room having its own bathroom was ideal. Craig was available and attentive to our needs. Great house - clean, roomy and nicely decorated. We had a family reunion with ages 1-85 and everyone had the best time. The house has two large family rooms with a large kitchen and eating area perfect for large groups. Beautiful views, beautiful beach, and so nice to have the pool too. I have taken way too long to write this but I cannot say enough good things about this property! The property is fully stocked from the deck to the kitchen for a large group, with everything from rockers to multiple coffee pots - even a salad spinner! It was clean and comfortable with something that was very important to us - plenty of seating room to sit together and visit. We had ages from babies to great-grandparents so the only thing I can think of that would make it perfect would be an elevator! $350 Cleaning and $200 bed linens with beds made 25% down at booking, additional 2 payments can be made prior to arrival 180 days and 120 days Weekend special, book a 4th night $500 *Web site will not allow me to customize a payment plan but will be done in the rental agreement.